Ask fellow campers about "Pioche RV Park & Campground" and nearby attractions. Previous poster has Wrong Park - the free park is on 4th North- and is by donation. Pioche RV Park 462 Bush St offers $100 weekly rate FHU or $25 per day. We camped at Pioche RV Park & Campground in a Motorhome. This nicely kept FREE RV park is spacious, level and right in town. It is run by the town and donations are requested. You are allowed to stay for 7 nights. Water and Sewer is available at each campsite. We camped at Pioche RV Park & Campground in a Fifth Wheel. 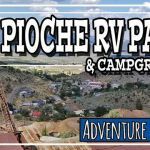 Are you affiliated with Pioche RV Park & Campground ?